The Pocket Sled Kites from Paul's Fishing Kites are designed to be used from small fishing rods with reels spooled with 8 to 15 kg fishing line . Paul's rig (see photo below) is a 9/0 Penn Senator on a short stout fishing rod. The reel is spooled with 900 metres of 50lb dacron. This rig is capable of setting 3 hooks 400 to 500 metres offshore while using a single kite. This set up can also fish the full 900 metres out when a second Pocket Sled Kite is flown 200 to 300 metres inside the first kite to help support the mainline clear of the water. Paul has successfully used a Penn Seaboy reel spooled with 350 metres of 8kg line and a single Pocket Sled Kite. Pocket Sled Kites are an ideal rig for newcomers to the kitefishing scene and are easily handled by one person. Pocket Sleds are available in two sizes. The large Pocket Sled provides sufficient pull to fish and retain stability between 7 to 20 knots of wind speed. 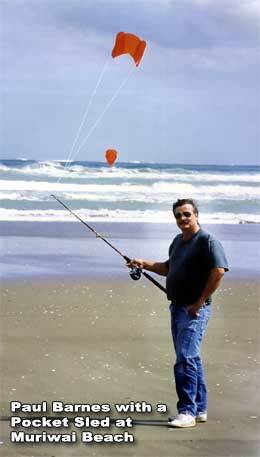 The small Pocket Sled Kite can be fished from 10 to 30 knots. Pocket Sled Kites are a downwind kite, so a wind that is blowing more than 45 degrees offshore is required to give optimum fishing performance. Pocket Sled Kites are a great addition to the surfcasters tackle box. When the winds are offshore the Pocket Sled Kites will assist you to cast further than you ever dreamed possible.